Here at Aberdeen Mad, we have only ever reviewed books about the Dons - usually Gothenburg-centric tomes, accounts of AFC's history, and player autobiographies. So when offered the chance to review the memoir of a former boy band member, you'd think I'd politely turn it down with an amused and bewildered air. Not so. 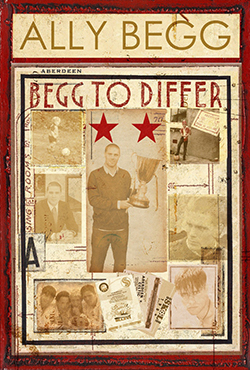 'Begg To Differ', er, differs in a few ways from most pop star autobiographies, and there are a couple of clues before you've even opened it - for a kick-off its cover (by Paine Proffitt) will be instantly familiar to readers of Aberdeen FC's matchday programme, and it includes the Dons' two European stars in pride of place. Turn to the back cover and there is Pittodrie Stadium, and the foreward is penned by none other than Alex Ferguson – yes, that one. But what have the Dons got to do with a former boy band member? When that particular teen idol is Ally Begg, the answer to that is: everything. 'Begg To Differ' book tells the story of the Aberdeenshire-born former Bad Boys Inc (remember them?) star, but it does it in a slightly unusual way - and not just because it is nowhere near as egocentric as most celeb autobiogs. Totally the opposite, in fact, and not just due to the earnest assertion near the start of the book: "I implore you not to judge me on the dropped names. I do not have any celebrity friends, nor do I feel the need to have any." Begg tells the story of his fascinating life through the ups and downs of his time supporting the Dons, and the family (mainly Dad and Grandpa), friends and colleagues with whom he has shared that journey. Begg's is a life that has taken him around the world both during his Bad Boy era and in his subsequent career in sports production, yet his stories are told with a charm that stems from his surprising humbleness. Anyone used to Begg's Twitter account will be immediately at home with the infectiously enthusiastic and almost innocently joyful tone of his writing (he certainly loves an exclamation mark or four!!!!). And while 140-character tweets should not translate to great book-writing, the style somehow works here. The element that possibly doesn't work is just how Dons-centric this book is – I frequently wondered how a Dundee Utd fan or Sevco zombie could read this book without irritation at Begg's framing of his life against Aberdeen FC's history. But for a Dons fan this is a joy, as should it be for any football fan. And if, like me, you were born at around the same time as the author (the early 1970s), it is impossible not to relate to much of Begg's tales of a Dandy upbringing, if not the fascinating insights into the '90s pop music industry! But in that sense it manages to be two books in one; each a worthy and entertaining read. You can buy Ally Begg's book 'Begg To Differ' from Amazon and all good bookstores.